Pet Dental Care: Why the Resistance? Pet dental care is so much more than white teeth and great smelling breath. 85% of dogs over the age of 3 will have some degree of periodontal disease. Periodontal disease not only leads to unsightly tarter and bad breath, but causes infection, bone loss, and chronic pain when left untreated. Dental disease is one of the most common diagnoses in the exam room yet brushing and regular maintenance is hard. For puppies and kittens, we send home dental kits with the hopes of acclimating them to a lifetime of brushing and at-home dental care. We hope for regular, routine dental care throughout the pet’s lifetime with the intention of avoiding infection and pain and that one monumental dental experience as a senior pet where a lifetime of inattention results in dental extractions. How do we define neglect? What if I showed you this picture of a dog’s mouth and told you she was a puppy mill survivor forced to have a litter every year, living in a tiny cage with matted fur, with no dental care (not even a dental treat in her lifetime). Is this neglect? Now what if I told you these were the teeth of a very beloved 10 year old Pomeranian who lived in the lap of luxury with a well tended hair coat and wardrobe accessories. She had complete adoration and attention to all of her medical needs….except dental care. What if I told you while her owner loved her very much it was that very love that prevented her from tending to her pet’s dental issues? What if I told you her person’s fear of anesthesia forced her to live with chronic pain, infection, and rotting bone. Is it neglect now? (*For the record, this is not a client photo but some random internet PetMD image). There are many resistances to pet dental care. I believe strongly in the benefit of routine dental care. I have heard too many testimonials to not believe it matters to our pets quality of life. If we wait until our pets have stopped eating or cry in pain, we have simply waited too long. Remember these are animals that survive because of their ability to withstand pain and disease without drawing attention. Your coworker may complain of a tooth abscess but still eat his lunch and show up at work day after day, just dealing with the chronic pain until one day that infection becomes so bad he lands himself at the ER with injectable antibiotics. Our pets are no different at hiding that pain. I love my pets and have those same feelings of concern and fear but I know the benefits will out way the risks. I also know that all precautions including a balanced anesthetic approach, careful and detailed monitoring with a designated trained technician, IV fluid support, thermal support, and pain control will be part of the anesthesia event to minimize risks. I can’t take away the fear… as your veterinarian I can only assure you that we do everything in our power to minimize the risks to hopefully relieve your fears. Many owners may have had a terrible experience a decade ago. We are always striving to improve your pet’s anesthetic experience, using the newest research and medications to allow the best experience possible. Truth. Pet dental are is expensive, especially if we are undoing years of inattention. Personally we cap our dental estimates because we believe very strongly that the pets NEED this service. It is unfair to leave behind painful or infected teeth and wish to reward the owner taking the steps to care for their pet. Too Young or Too Old. I always got a little squeamish when I saw the 14 year old dog with a mouth of pus, mobile teeth, and a risk of a jaw fracture secondary to that infection knowing I needed to say the words, “Your pets needs a comprehensive dental assessment and treatment”. It all felt like too much too late. There were probably many years of dental recommendations and now the teeth were in desperate need of attention. Or if they new clients to us they may have heard for 5 years “Their pet was simply too old for anesthesia or dental care.” But then I treated the 12 year old dog, and then the 14 year old dog, and then the 15 year old dog or the 16 year old cat and I couldn’t deny how much better they felt afterwards. Owners would report “I had no idea but now they feel like a puppy or kitten again!” My oldest dental patients are usually 15-16 years of age and I love the reports of how much better life is after. “Where there risks?” “Yes” but they were calculated in the hopes the benefits would outweigh them. Does quality of life matter more than quantity? Save all the teeth! Fear of tooth loss. My job as your pet’s veterinarian is simple…to give him a pain free, disease free mouth so it is a disservice to leave any compromised or infected teeth behind just to “save a tooth”. The reality is these teeth are worthless and most pets eat better without them. Also pets use their teeth very differently than we do. They have fewer molars and don’t do a lot of “grinding” and since we don’t make them hunt for their food, many don’t slow down a bit with eating or playing even when we take every single tooth. For those worried about how their pet could possibly eat without the teeth, many actually eat much better without mobile or painful infected teeth. But do they really need it or is this just some great upsale? I am not a sales person but I do have a passion for dental care. There are too many times to count when a tooth “looked” just fine and the pet didn’t complain only to find a problem and have the pet feel so much better. I tell clients “Our pets can’t tell us where it hurts so it is my job is to find the problem and fix it.” An exam under anesthesia and with dental radiographs tells the story. Just like eat food and brush everyday we are still advised to have our teeth cleaned regularly. Relying on just eating a kibble or dental chews is often not enough. Some breeds are very prone to developing dental disease (smushy faced breeds, smaller or toy breeds, those with crowding). Researching the breed and preparing for the dental care necessary in the pet’ s lifetime is big step in responsible pet ownership. So here is my big secret…I don’t brush everyone of my pet’s teeth every SINGLE day. I barely get my kids to brush the necessary times per day. I try! Regular dental assessments, cleanings, and appropriate treatment are a priority though. We are all human, just doing the best we can for those we love and care about, including our pets! If your pet has had a dental treatment recommended and you have stalled, resisted, or just ignored the recommendation I urge you to really think about the reason why. As a veterinarian, it is my job to help pets and their owners enjoy a great quality of life and effective communication must be part of the equation. Don’t hide those fears or concerns! Tell us and we may have ideas or solutions to those hurdles holding you back from getting those teeth the attention they need. Pet Health Insurance… Is it worth it for you and your pet? I was in veterinary school when I acquired my first pet as an actual adult, a little Chocolate Lab puppy. Then I quickly learned as a I went thru my veterinary school courses of all the things that could go wrong or accidents that could happen in this puppy’s lifetime. Then I became a hypochondriac and with each new disease I learned about, I was convinced my dog had “IT”. Gagged once= probably Physaloptera sp. esophageal worms. My mind was frantically planning for the esophageal endoscopy. When he misstepped across the yard my mind rushed to the diagnosis of debilitating hip dysplasia that would certainly need a total hip replacement. The good news is he coming 11 years old now and really hasn’t had all those rare and not so rare diseases I had learned of. I also learned there were more and more options for my pet’s health care and with those options and expertise came expense. Pet health care is expensive. This puppy was family and if needed care to save his life or give him the best quality of life I wanted to have that option, even though my pocket book as veterinary student was pretty devoid of means of doing so. I remember the dogs I had growing up and the extent of their veterinary care and expense. We hauled them to City Hall once a year for “shots” and treated the random ear infection or rash. Veterinary medicine had changed a bit since. Brody loved this activity but as a vet student I saw a ruptured cruciate, iliopsoas injury, or fracture, etc just waiting to happen! In veterinary school I learned about the many advanced care options available including imaging, cancer treatment, critical care/ICU stays, or complex surgical or dental procedures. These wonderful options could quickly deflate a savings account. Not to mention the pets we treated with chronic illnesses such as allergies, where the costs added up more slowly but steadily. If money was no object, would I want these options for my pet? The answer was “Yes!”. “Could I have set aside funds every month for the emergency or severe illness I dreaded?” Sure. But I also knew care could be in the thousands. At $20-30/month my pet was covered for the worst…which could cost thousands of dollars. At that same rate of savings it would take my 150 months, or 12.5 years to save $3000 as an emergency fund. I could have played the odds that my pets would be healthy and have no issues in their lifetime but as a veterinarian I knew the reality. Over 50% of dogs over the age of 10 will develop cancer. And how many puppy owners I saw that had just dropped down a sum of money for their new pup, collar, kennel, and food only to struggle to find the $1000 it would need when that same clumsy puppy tripped up the stairs and broke its leg. I have sat with clients that had no money but had all the want and willingness to help their pets and there is NO worse feeling. I have worked for free, had the pets relinquished, or found resources or rescue groups to help but there are only so many dollars available. No one expects bad things to happen to them and so that is where insurance may be worth the money. So I got pet health insurance and paid my monthly premium and thought about the money I was “wasting” and how I should be investing it in retirement. We had actually talked about dropping it. Why would a vet have health insurance…it seemed most things to fix where within our budget and manageable. Then I felt a firm boney mass near my soul-dog’s ear, arising from his skull. My Newfoundland had bone cancer. As a veterinarian I knew I could do nothing and he would be gone in months or I could seek care and hope for better. There were just a few places that offered the treatment options we needed, including Flint Animal Cancer Center in Fort Collins, CO. 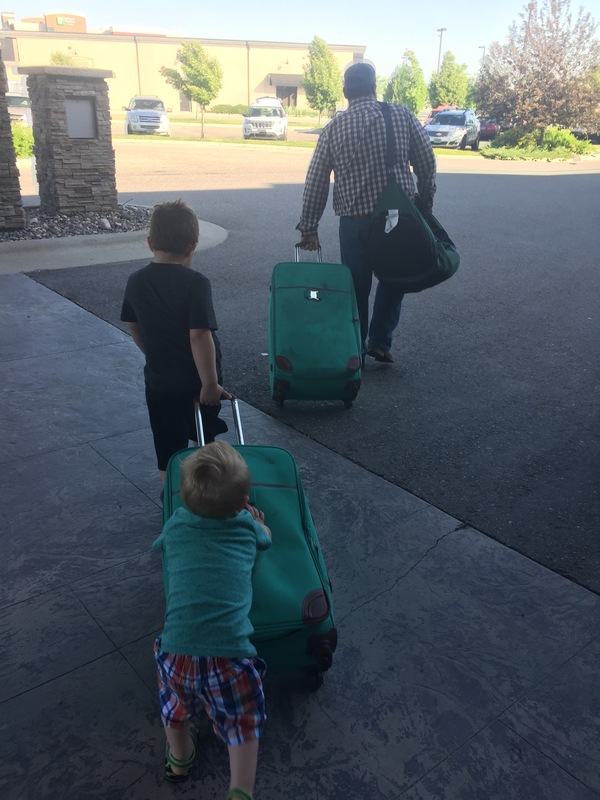 So we loaded up as a family including my 2 week old newborn and traveled for stereotactic radiation. The price tag was about ~$10,000. No way, no how could I have justified that expense with the costs of a newborn, student loans, and life. I would have been limited to the option of pain meds and waiting. But my Embrace Plan, the same one I had contemplated cancelling months before, paid 90%. $10,000 may be crazy to spend on a dog…any dog… soul mate or otherwise but I figured a bargin compared to the cost of that same technology applied in human health care. When owners complain about the costs of veterinary care being more than human health care it highlights the misunderstanding. The same supplies, drugs, education, equipment sits in our veterinary hospitals but as pet owners we pay out of pocket and feel every single penny leave our wallet. I have received statements and bills from hospitals and half the time I have no idea what was charged to the insurance company (in my mind it reads: $40 million dollar IV catheter. You own $1.47! So someone, somewhere paid or negotiated the difference). Then Piper, our beloved GSP, developed Congestive Heart Failure. Echocardiograms and monitoring were doable without the worry of cost. I had considered stem cell treatment for her shoulder arthritis and had the $2000 cost approved through insurance before her heart condition worsened. Then that same puppy I acquired in vet school now with a gray face and aging body, developed a limp. I had done rads after rads with radiologists reviewing and though I suspected elbow arthritis, never got the answer I needed. A visit to Colorado State University and a CT scan provided the answer I needed to know. So when we got a new puppy that was learning how to explore the world with its toxins and hazards and how to use its limbs without falling or tripping, it made complete sense he needed health insurance too. I couldn’t stomach the thought of not being able to offer him the care I knew was available just because money was the limiting factor. Houses, boats, and cars…well they all have a set insurable value. But pets their value is determined by our connection to them. For some they may be totally replaceable but not in my world. It may come down to priorities…what do you want to spend your hard earned dollars on. I value health care and realize the options and associated expense that comes with it. My pets are family and I want the best for them. I just don’t have unlimited funds to do that so insurance has helped offset the financial strain. In addition to the question of “What is your pet worth to you?” I would consider “Are the odds in your favor?”. The reality is certain breeds are more prone to medical issues such as cancer or orthopedic disease. General higher risk breeds may include the giant breeds such as the Newfoundland, Great Dane, or Mastiff and also Bulldogs (I once saw a bumper sticker that read “Support your veterinarian. Buy a Bulldog” and perhaps there is some truth in that). Is your pet’s lifestyle such that an injury like a broken bone or athletic injury more likely to occur? This could include the canine athlete or working dog (hunting, ranch dog, or competitive dog) or the dog that runs at the family farm (with its associated risks of livestock, 4-wheelers/Quads, toxin, etc) on the weekends. Then insurance may be worth it. No one gets home insurance planning for the day it burns but the reality is insurance is there if the worst should happen. Pet health insurance is largely designed to cover your pet’s accident and disease, not wellness care. There are several insurance options and resources to fit your unique needs and budget. The following companies are consistently well rated and recommended (Insurance Comparisons) : PetsBest, PetPlan, Embrace, and Healthy Paws. 1) Does the policy cover hereditary or congenital diseases? If you have a Lab and they don’t cover cruciate disease surgery your plan won’t be very helpful to you. Research the diseases must likely to affect your pet’s breed and read the fine print to ensure you are covered. 2) How are pre-existing conditions handled? This is still the world of insurance so if you pet has developed a disease such as allergies or hip dysplasia prior to acquiring your plan prepare for limitations in your coverage of the condition. The best way to get around pre-existing conditions is to get insurance early in your pet’s life. 3) What are the limits and deductible? Like all insurances, a higher deductible will mean a lower monthly premium. I personally have a higher deductible with the idea that my plan covers for the big and major. Some have no annual limits, others might. 4) How much and what do you want covered? Are prescription drugs covered? If you have an athletic dog such as a hunting dog which may be prone to injury you may want to make sure rehab services are covered. You may need to tailor your plan if you wish to have routine vet care (vaccines, dental cleanings, heartworm testing, etc) covered. 5)How do they pay out? I prefer they pay a portion of my bill and not a set amount for the condition. Costs vary from location to location and this ensures I am not having to price shop. Most plans can be tailored to cover anywhere from 70-90+% of the treatment costs. Pet health insurance isn’t for everyone. Only a small percent of the millions of pets in this country are insured but I am glad for the option and how it helped my family make decisions based on medicine and not money. Could my pet’s go their lifetime and I never get my money back? “Sure”. But their policy could also prevent heartbreak if the worst does happen. Consumer Reports: Is Pet Insurance Worth It? 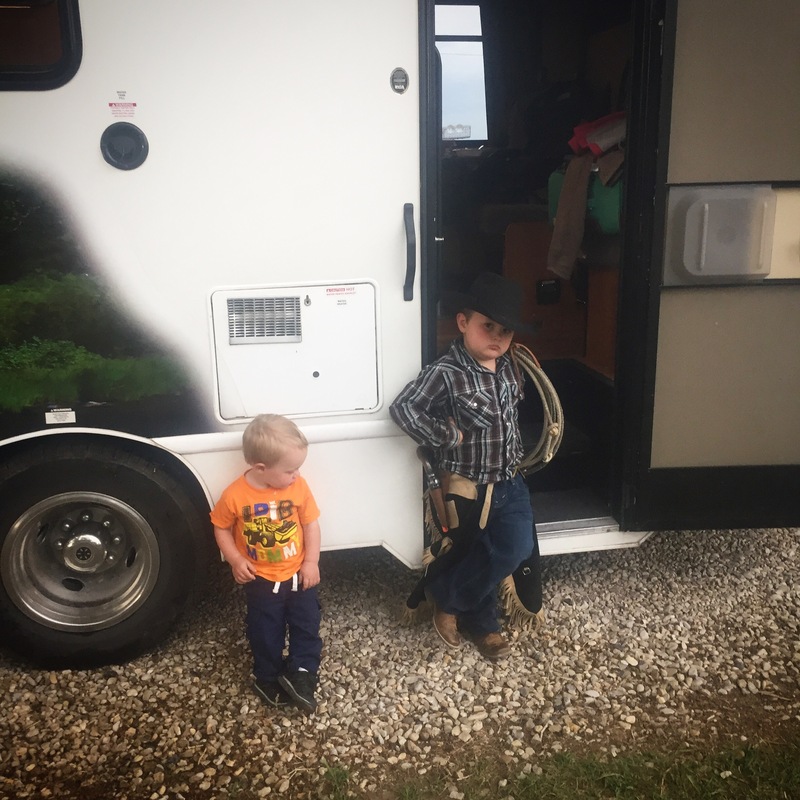 Top Reasons RVing with Kiddos Rocks! 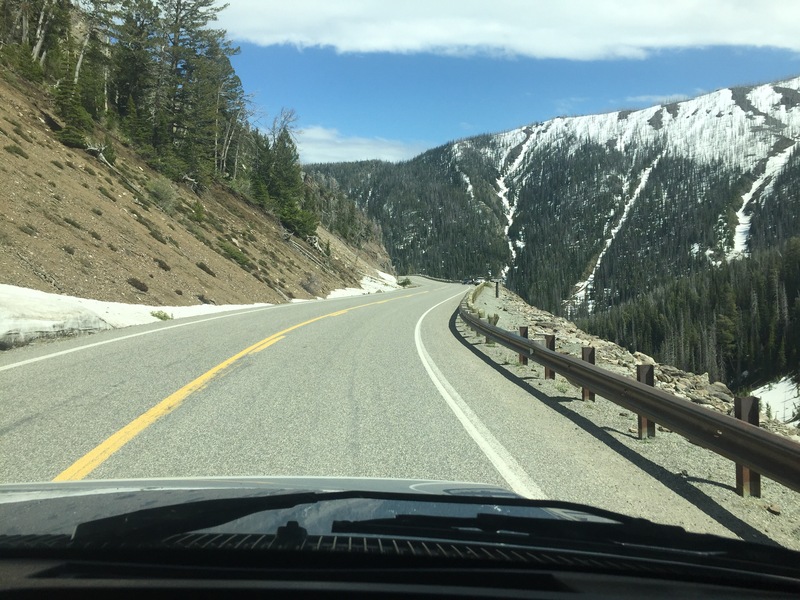 I had long dreamed of an RV adventure and it remained at the top of my Bucket List. We typically do an annual vacation to the Black Hills but Hubby had suggested we head to Yellowstone. Imagine my joy when he agreed to renting an RV. 1. Kitchen and snack drawer on wheels. No one likes a hangry kiddo or adult for that matter. Eating out with kids while pleasant in my imagination usually involves waiting too long to decide to eat, then suffering through the finding of a restaurant and “The Wait”. I really am trying to raise decent human beings but whether it is 30 seconds or 30 minutes until the hangry kids get their food that time is usually among the most stressful of my life with desperate distractions of crackers, color crayons, or people watching. The joy of just pulling over for a snack or meal without worry of destroying someone else’s dinner plans…amazing! One afternoon we had broccoli cheese soup and sandwiches while watching a fox catch mice. Best lunch entertainment around. 2. Immediate bathroom access. The reality hit when I passed a long line of poor full-bladdered people. Do you know how much time is spent finding a rest room, standing impatiently in line, and peeing…. a lot. And one of mine is still in diapers so that is hit or miss if their is a changing area. 3. Keeping a routine. When staying at single hotel it isn’t so bad but the packing, unpacking, and new sleeping arrangements of hotel room hoping made for some stress in the past. Not in an RV. Unpack once and enjoy a routine of consistency. 4. No need to pack a 72 pound diaper bag anticipating the variety of weather patterns you may encounter and then potential for dirt and spills! Especially in Yellowstone where the weather is variable, it has proved invaluable to have all our clothes within arms reach. Big Windows. Big Views. Happy Kid. 5. Travel entertainment. 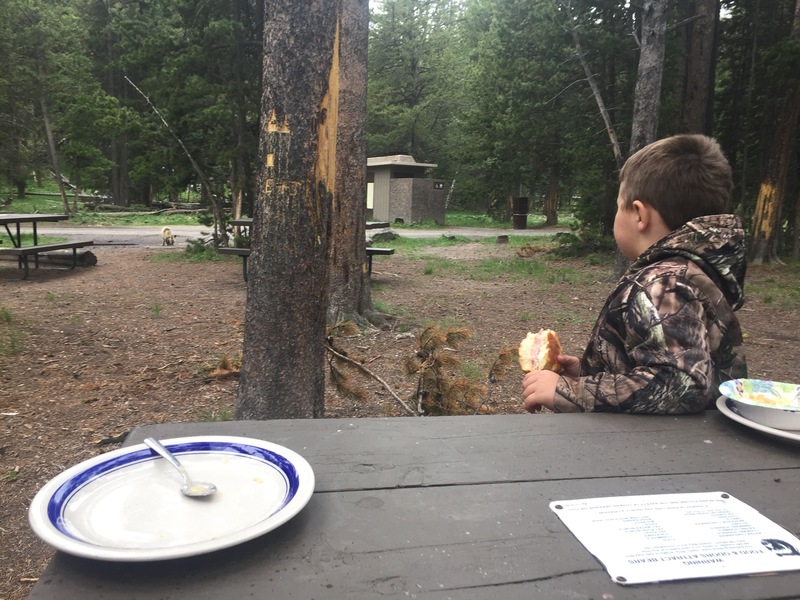 The kids stayed buckled but bigger windows and a table to sit by meant more opportunity for wildlife viewing and table top activities. 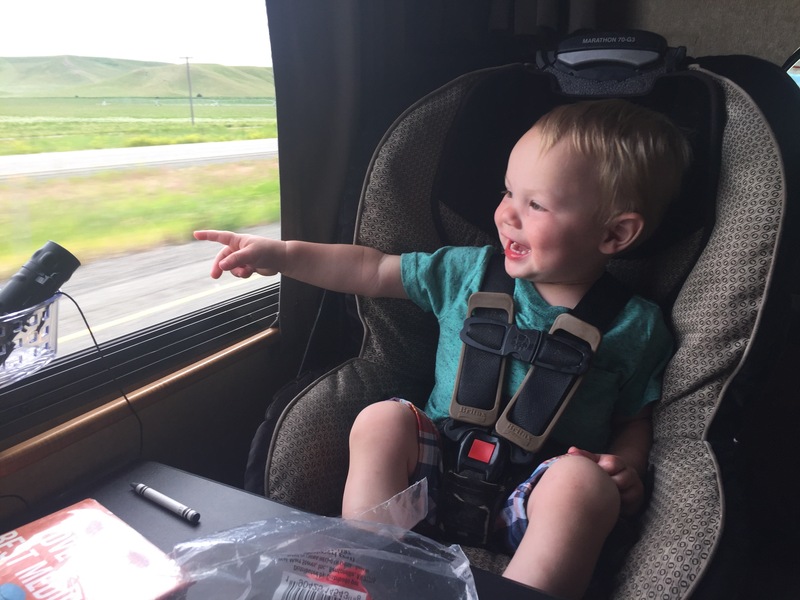 RVs mean lots of room to spread out and enjoy some travel games, coloring, and activities. 6. See more. Do more. Especially for a big park like Yellowstone this allowed us to go with less concern of keeping within distance of our hotel. If the kiddos were needing a break we simply pulled over and often enjoyed a great view or short hike for the kiddo still in good spirits. A cranky kiddo at the museum meant one of us headed out to the RV for a quick nap while the other continued to get some sights in. Historically, with a hotel experience that meant heading back to rest and re-coop, then loosing any motivation to venture out again. With a hotel, we usually planned a single big daily outing to factor in grumpy or down time. A suctioned shower container made a great binoculars holder. They were in ready reach and didn’t get lost. More shower containers held cows, crayons, fruit snacks, and whatever needed to be in easy reach of the kiddos. 1. The biggest con is the RV parks and camping arrangements. I haven’t had “neighbors” or lived in a “town” in a while. 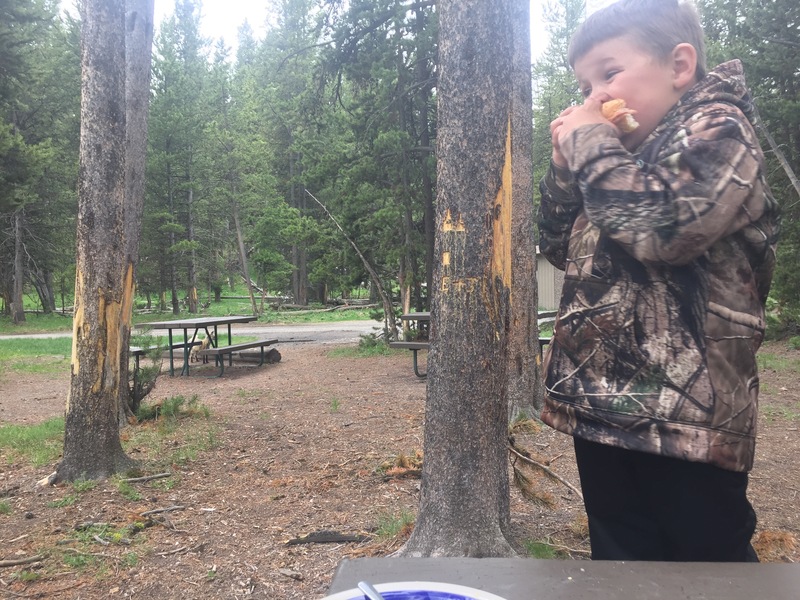 Due to our shorter notice and Yellowstone’s popularity, the reservable camp sites were full. The RV parks are quite nice but still leave you feeling a little too close to your neighbors and very suburb-y. I soon realized I can never move back to town with the manicured postage stamp shaped yards and neighbors within view. My kiddos are semi-feral, free range sorts who spend most days semi-dressed, with no concern of their decibel level, and more awareness of staying out of the corral than a street. So it was a bit of a lesson for my country bumpkins! But riding their bikes on actual paved roads proved novel and fun. The exception was the Cody WY KOA. While “neighborly” there was some breathing room and it didn’t feel so rectangle lot suburb. Plus there was a ton for the kids to do, including a pool and giant jump thing, so they loved it. 2. Another con… hot showers. The RV water heater was a waste of propane and only served to heat the water to just above chilled! After our community shower episode where I probably mooned a nice retired couple while struggling to keep the kiddos from reverting to their feral naked states, I thought kiddo camper showers were the answer. Nope! 3. Safety. 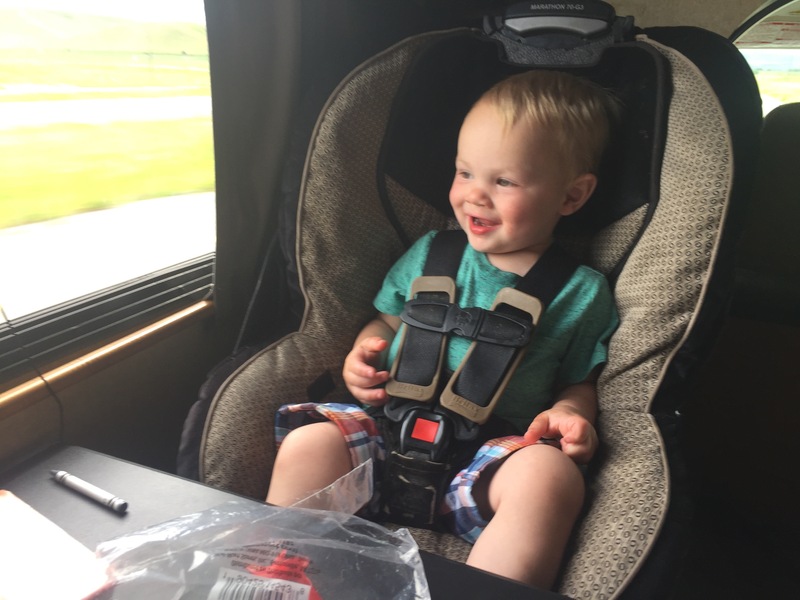 In my research, many argued traveling with kids in a RV was unsafe due to non-secured items and seat belt arrangements. We had an initial strawberry fiasco where a carton of strawberries shot out of the unsecured refrigerator when the refrigerator wasn’t properly latched on take-off. Overall, our maiden RV voyage was a wild success and may have sparked the “bug”. The kids loved it and small home living wasn’t all that bad. I wrote this post weeks ago and it just sort of sat here. Now that we have moved into haying, breeding, and another season I figured I would share my branding recap. Time just slips away some times it seems. The branding season is winding down. This season is marked by weekends spent in the dust and dirt, working cows and calves, prepping them for summer pasture. Branding marks the end of the spring calving season and a celebration of the product of careful attention to matings, nutrition thru pregnancy and lactation, and surviving months of stress and sleeplessness. While calving fills my camera lens with images of cute calves, it also means restless nights forcing tired and brace against the cold night air to check the herd in the event one of the cows may have calving troubles, emotional fatigue with the loss and struggle with nature’s unkindness, and planning your life events in less than 4 hours chunks of time less we not be available to the needs of the cows and sheep. Branding as it is so-called is really the opportunity to carefully examine each calve as they come thru the calf cradle (a small chute that allows the calf to be restrained) or via cowboy or cowgirl restraint. Each calve is given vaccinations to protect it against respiratory bugs and other diseases it may encounter later in its life and the bull calves are castrated. Each calf spends about a minute or less for this entire process to reduce stress to the calves and improve efficiency. Most ranches do at least 100 calves, if not hundreds in a day’s work. Branding is also a celebration of family, friends, and community. Much like days gone by, branding is done with the help of our neighbors and friends. Many hands make light the work to be done. Neighbors are miles away but in true selflessness they are as available to give a day’s work as a phone call and quick pickup ride down the road. Often more family and friends join for branding day than Thanksgiving or Christmas, and the meals that follow are often as impressive. There is hierarchy amongst the branding workers, with the job of bringing in the calves and doing the physical restraint job left to the young and fit “whipper-snappers”. The youngsters watch and learn, hoping to gain years and pounds so as to be a calf pusher at the next branding. Not all calves are branded but for those moving to common pastures or where ownership must be proven a hot iron is applied to the tough haired hide, leaving behind a permanent mark of ownership. The brand itself often represents generations of ownership and legacy. My own registered brand once belonged to my grandfather. The mark of a brand must not be “blotched” or “smeared” as it may become unreadable and be a permanent mark of poor workmanship for the life of the animal. So the “brander” position is reserved for the skilled and experienced. The remaining jobs sort of fall in order with those available but often years of experience absolve one of the more physical jobs, leaving vaccinating, re-tagging, or castrating. Working calves may well be a necessary task at a ranch, but more so it is that coming together, sharing of food and stories, struggles and drama, and involving the next generation. More than just a “job” to be done it is a reflection of generations of care and concern for the animals and land in our care. Ranchers strive to raise healthier, improved cattle that meet the needs of the consumer. Spring on the farm brings new life and one of the first signs of that among others is the bright fragrant lilac blooms. We have a row of lilac bushes (part of a windbreak- where trees and shrubs are planted to block snow and wind, protecting the farm yard) that tower about 10 feet high and line the dirt road that goes to a cow pasture. When in full bloom, they form a tunnel of sweet fragrance and the boys and I always take in some big whiffs as we drive past aboard the 4 wheeler. The science of scent has sought to uncover why we connect so powerfully to it or why it brings up memories of long ago. Brain anatomy is likely the answer, where incoming scents are first processed by the olfactory bulb. This region has direct connects and association with the two brain areas that play a key role in emotion and memory, the amygdala and hippocampus. None of our other senses pass this way so it seems that our anatomy has primed us for our sense of scent to trigger emotion and memory more than any other. Spring is making way for summer and this past weekend of hot weather faded the vivid purple blooms and so faded that characteristic floral fragrance. Where once had been the towering shrubs of cheery blooms and a wall of comforting, memory-triggering odor now stands untidy shrubs whose job is purely utilitarian…block the wind. I had prepared myself for the reality of their departure. I had preserved some of the blooms in a infused oil and had gathered inspiration to make some soaps that would keep that scent alive just a little longer. My first attempt at liquid hot-processed soap swirls. Everything has its season and the farm brings that more to reality than any other location. While the scent of lilacs is fading, the blooms of the peonies are readying, waiting to open and release their own fragrance. Peonies are one of my favorites and I had chosen our wedding date to coincide with the peony bloom. There just might be a peony inspired soap in the works.